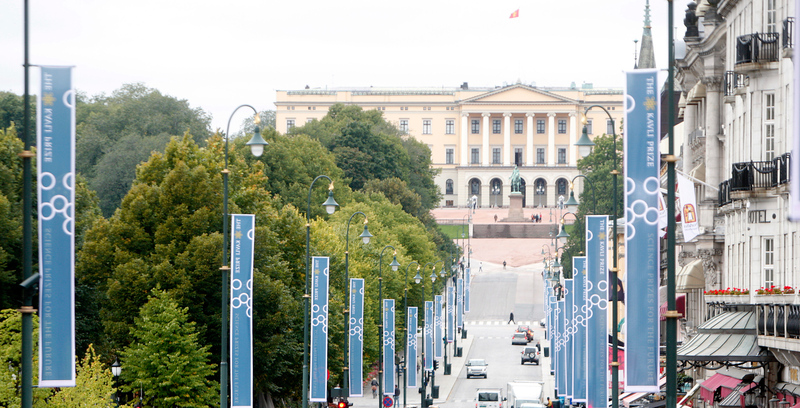 On September 9, 2008, 2:00pm (Central European Time), the first Kavli Prize laureates will be honored at a ceremony in the Oslo Concert Hall and receive their medals from His Royal Highness Crown Prince Haakon of Norway. The Kavli Prize is a partnership between the Norwegian Academy of Science and Letters, The Kavli Foundation, and the Norwegian Ministry of Education and Research. Each laureate receives a scroll, medal and a share of the $1,000,000 prize for his category. For more information about the Kavli Prize laureates and web cast, click here. Human infants learn to talk and starlings learn to sing, but just how different are the two? The answer on one level is obvious. Songbirds never learn to talk, at least not in the way even poorly educated humans can. Nor do other animals, such as monkeys and dolphins, that appear bright and expressive but never seem able to make up more than the simplest of sentences, if even that. In its complexity and power to convey ideas and emotions, the human gift of language does seem unique in all nature. But deep down, at its roots in the cells and circuitry of the brain, that gift may not be exclusively human after all. It's superior, yes, but is it truly one-of-a-kind? This is a much-disputed question among scientists, and it's central to the research mission of the Kavli Institute for Brain and Mind at the University of California, San Diego. Read more. One of the wonders of biology is how trillions of living parts in a human body work together constantly to produce reliable and predictable events, like the beating of the heart, the taking of a breath and the processing of light from the eye into words like these, translated by the brain into information. Equally remarkable -- and of great importance to medicine -- is that each of these cells has its own distinctive character and its own way of reacting to its environment. A dose of radiation, changes in nutrition and other events can have sharply different effects on individual cells, even in a tissue or tumor where all are labeled the same. To understand human biology fully, it is necessary to look at the metabolic processes of cells one by one. Such single-cell analysis was beyond the reach of technology until recently. Scientists and engineers, however, are learning how to sort cells using microfluidics and to examine the RNA and DNA of each. At the California Institute of Technology's Kavli Nanoscience Institute, researchers have found a way to integrate the whole process on a device about one-inch square, putting single-cell analysis on a single chip. Read more. The Kavli Institute for Astronomy and Astrophysics (KIAA) at Peking University has officially commenced its academic program, taking residence in a new facility dedicated to the Institute. The landmark event was celebrated with a ceremony that included Xu Zhihong, president of Peking University; Zhang Xian-en, director of the bureau of basic research at the Ministry of Science and Technology; Ding Li, director of the bureau of basic research for the Chinese Academy of Sciences; Douglas Lin, a professor of Astronomy and Astrophysics at University of California, Santa Cruz and founding director of KIAA; and Fred Kavli, founder of The Kavli Foundation. "I expect the Kavli Institute at Peking University will be regarded as an international center of excellence in Astronomy and Astrophysics," said Fred Kavli at the ceremony. "Pure science is a human quest and everyone must contribute," said Zhang Xian-en. The new facility is located on the campus of Peking University, by a water bank near Weimin Lake. Overlooking the historic Yuan Ming Yuan summer palace, the building is designed with a traditional Chinese exterior and lake-garden, while the interior was conceived to stimulate intellectual interaction and academic exchanges between faculty, students, and visiting scholars. The design supports the Institute's mission to be a forum for global scientific exchange, an incubator of innovative projects, and a training center for post-doctoral and student scientists from around the world. ROGER BLANDFORD, Director, Kavli Institute for Particle Astrophysics and Cosmology at Stanford University. MARTIN REES, President of the Royal Society; Master of Trinity College, and Professor of Cosmology and Astrophysics at the University of Cambridge. GEORGE M. WHITESIDES, Director, Kavli Institute for Bionano Science and Technology at Harvard University. ERIC R. KANDEL, Director, Kavli Institute for Brain Science at Columbia University. DAVID GROSS, Director, Kavli Institute for Theoretical Physics at UC Santa Barbara. In the fall of 2007, the directors of the Kavli institutes gathered in Santa Barbara, CA for a special symposium about the present and future of astrophysics, nanoscience, observational astrophysics and theoretical astrophysics. Hosted by Alan Alda, these panel discussions have now been posted on the Foundation web site. The Gamma-Ray Large Area Space Telescope (GLAST) has revealed its first all-sky map in gamma rays. Showing the glowing gas of the Milky Way, blinking pulsars and a flaring galaxy billions of light-years away, the onboard Large Area Telescope (LAT) is expected to discover many new pulsars in our own galaxy, reveal powerful processes near super-massive black holes at the cores of thousands of active galaxies, and enable a search for signs of new physical laws. "What impressed me the most is that everything went by the book," said Peter Michelson, LAT principal investigator at the Kavli Institute for Particle Astrophysics and Cosmology at Stanford University (KIPAC). "We're elated." Read more. Meanwhile, a study led jointly by KIPAC and researchers from the University of California, Santa Barbara reports a powerful collision of galaxy clusters that provides observational evidence for dark matter and supports the view that dark-matter particles interact with each other only very weakly or not at all, apart from the pull of gravity. Read more. The Kavli Institute for Cosmological Physics, University of Chicago was host of "The Sloan Digital Sky Survey (SDSS): from Asteroids to Cosmology" -- an international symposium dedicated to reviewing progress and prospects in astronomy, including observational contributions from the SDSS and from other major surveys, theoretical interpretation of the results, and plans for the next generation of large astronomical survey projects. While researchers from several continents shared new findings, broad attention was particularly given to the discovery of a huge, "comet-like" object zooming through the sky, as well as a new map of a "halo of stars" surrounding our galaxy. Abstracts from the symposium can be found here. Kavli Institute of Nanoscience at Delft University of Technology. Professor Leo Kouwenhoven is one of the European researchers to have been awarded a European Research Council (ERC) Advanced Grant (1.8 million euro over 5 years) to further develop his research in the field of "quantum optoelectronics." . . . In Kavli researchers were among an international team reporting on a new type of molecule comprised of two very different atoms: one natural and one artificial. . . . In Kavli researchers reported that a conductive layer does exist on the interface between two non-conducting pure organic materials -- a finding that in principle opens the door to a new class of organic electronic systems. Kavli Institute for Astrophysics and Space Research, Massachusetts Institute of Technology. According to a scientific report co-authored by the Institute's John Richardson, the two Voyager spacecraft have revealed that the sun's "bubble" -- the boundary where its solar wind of particles and radiation smashes into the interstellar medium that pervades our galaxy -- is squashed rather than symmetrical. . . . The Institute also announced achieving a significant advance in nanoscale lithographic technology, which could pave the way for next-generation computer memory and integrated-circuit chips, as well as advanced solar cells and other devices. Kavli Institute of Theoretical Physics at UC Santa Barbara. Joseph G. Polchinski, professor of physics at the University of California at Santa Barbara (UCSB) and a permanent member of the Kavli Institute for Theoretical Physics (KITP), shared the 2008 Dirac Medal, which was award by the International Centre for Theoretical Physics. The award was in recognition of fundamental contributions to string theory. Kavli Institute for Neuroscience at Yale University. Scientists reported evidence suggesting that the tiny cilia found on brain cells of mammals, thought to be vestiges of a primeval past, actually play a critical role in relaying molecular signals that spur creation of neurons in an area of the brain involved in mood, learning and memory. "Many neuroscientists are shocked to learn that cells in the brain have cilia," said Matthew Sarkisian, co-first author on the study. Read more. Kavli Science Journalism Workshop at the Massachusetts Institute of Technology. In June, the Knight Science Journal Fellowships program presented the second annual Kavli Journalism workshop. While last year's workshop was dedicated to astrophysics, this year's topic was titled: "Frontiers of the Brain." Taught by faculty from MIT, Harvard and the University of Massachusetts Medical Center. Among the 15 reporters selected for the competitive program were reporters from Time magazine, Wall Street Journal, Los Angeles Times, and The New York Times.